Spring Blooms Blog Hop – Welcome! 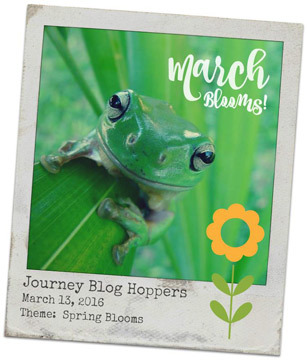 Glad you could hop on in for the March Spring Blooms Blog Hop. If you arrived from Rosemary Roca’s blog you are right on track. If not, no worries, just keep hopping along to come full circle! Daffodils are appearing everywhere so I decided to create a couple of cards with black, white & a pop of yellow! These were so much fun to design after a busy week. I choose my Sweet Today bundle (BD-0009) as my main stamp & die set to work with. Card #1 features layers & texture. It is so easy to create quick, elegant cards with just a few pieces. This card features a Whip Cream base matted with 2 layers in Black Licorice & Lemon Drop. 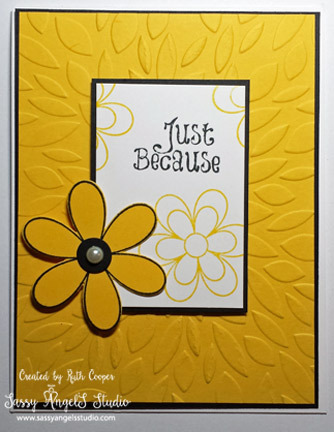 I ran the Lemon Drop layer through the Journey Grand (JG-0001) with the Petals Wall Embossing Folder (EF-0007). Two smaller mats of Black Licorice & Whip Cream form the focal point of the card popped with Journey Foam Squares (AD-0085). I stamped the sentiment in Black Licorice & added Lemon Drop stamped flowers for more interest. The die cut Lemon Drop flower with a Black Licorice & Pearl center (AC-0024) adds the perfect finishing touch. Card #2 features a different take on the black/white/yellow theme. This card features a Black Licorice base with Lemon Drop & Whip Cream mats. 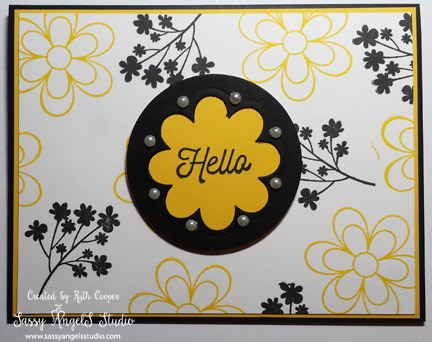 The Whip Cream mat was stamped with a yellow flower from the Sweet Today stamp set (SS-0079) and a black flower from the Lead Me stamp set (SS-0207), creating my own stamped designer background. I then cut 2 circles the same size using the Journey Circles Dies (DI-0039) in Black Licorice & Lemon Drop. I used the Sweet Today Flower die (DI-0016) to cut a flower center in the Black Licorice circle & mounted it on the Lemon Drop circle as a frame. I stamped the “Hello” sentiment from the Hello Amazing stamp set (SS-0210) in the center of the frame. I accented the flower frame with pearls (AC-0024) and used Journey Foam Squares (AD-0085) to mount to the center. The fun part of blog hopping is occasionally Blog Candy is offered! This candy is for anyone who is not currently a Journey Coach. 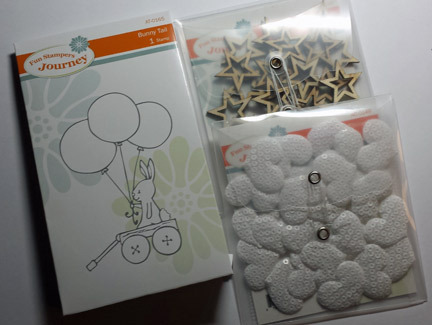 If you would like a chance to win the Bunny Tail ATS stamp along with Star Frame Elements & Sparkle Love Elements, please leave a comment below. If you are a fellow FSJ Coach please put coach or FSJ after your comment. A winner will be drawn by random on Tuesday to receive this small token as a thanks for visiting my blog. Now hop on over to Betsye Rose’s blog to see her wonderful bloom creation. Have a Fabulously Fun Week! Fantastic blooms! I was on the fence about that set and now you’ve made up my mind for me, thanks! I love the color combination you chose for these wonderful cards.